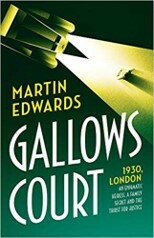 I would not allow the 1930s London backdrop to fool you, for Martin Edwards’ departure in his narrative fiction is far from a comforting historical novel portrayed by its cover. Gallows Court is a very dark thriller, in fact so dark, it is obsidian, with sharp edges that make one think deeply about those that surround us. It starts with a terse diary entry from 1919, from a girl living beside the Irish Sea; reporting the loss of her parents, allegedly from the Spanish Influenza epidemic. Though, little is as it seems from the island amusingly named Gaunt, and placed between Ireland and the British Mainland. Juliet Brentano’s diary entry also names a girl; a woman who becomes the enigma at the centre of this dark thriller, Ms Rachel Savernake. This name, this character I feel will become better known as the years pass, for as a character, she embodies the enigmatic nature of ‘being’, for it is often hard to determine if she is a good person, or someone we should fear. As Rachel Savernake’s foil we have the young and ambitious reporter Jacob Flint who works for London’s The Clarion. The young Jacob is soon promoted to head the crime-desk when Tom Betts is taken seriously ill after a car accident; one that is as unexpected as well as fortunate [or unfortunate], for Jacob Flint’s future career in journalism. There are a series of murders in London, terrible crimes as well as what appears crimes of karma, where some very bad people have met their maker. Mingled at the epicentre of the narrative is Rachel Savernake, the femme fatale, or is she? Daughter of a senior Judge, one that was feared as well as respected within a London establishment, until he became exiled on that island named Gaunt straddling the storms and gales of the Irish Sea. Was it a mental breakdown, the suicide attempt or the pressures of heading the Gambit Club that was housed in Edwards’ eponymously titled Gallows Court? Or was it related to his whispered moniker The Hanging Judge? Now an enigmatic figure in the cloisters of the London establishment, Rachel is living off her late Father’s inheritance, transforming herself into an amateur sleuth of sorts – one that is often found a little too close to her chosen quarry. She has also become a little troublesome for the forces of law, with her deductive abilities (or are they real or disguised) solving crimes that the police failed to unravel. Soon, Jacob Flint’s trajectory brings him toward Rachel, like a Moth attracted to the luminosity of a candle flame, and so starts this extraordinarily dark journey one that is as violent as it is insightful into the darkest edges of human nature. The power of this novel should come as no surprise as its author is a multiple award-winning writer who explores with rare insight into [what we term], the Golden Age of Crime Fiction. He’s also Editor of the British Library’s Crime Fiction Classics of that era, the Golden Age, as well as a senior official of The Detection Club as well as The Crime Writers Association. Though his fiction writing has always been evocative, with those early Harry Devlin legal thrillers, the Lake District mysteries – little can prepare the reader for the dark revelations contained within Gallows Court. I was delighted when I heard from Head of Zeus, that there is a follow-up novel currently being penned by Martin Edwards, and I am reliably informed that Ms Rachel Savernake may well feature again; because like many of us, we have good as well as bad parts to the facets that make us who we are, or more importantly who we portray to others in our fiction and in our reality. Gallows Court is a thought-provoking and violent crime-fiction narrative that explores [with a contemporary eye], the dark-side of human nature; but trapped within an evocatively realised historical thriller, like a Black Widow spider, encased in Obsidian. Editor’s Note: Click Here for the Shots Magazine’s report from the launch of Gallows Court in London on 18th September 2018.